Today is the anniversary of Albert Einstein's death in 1955. 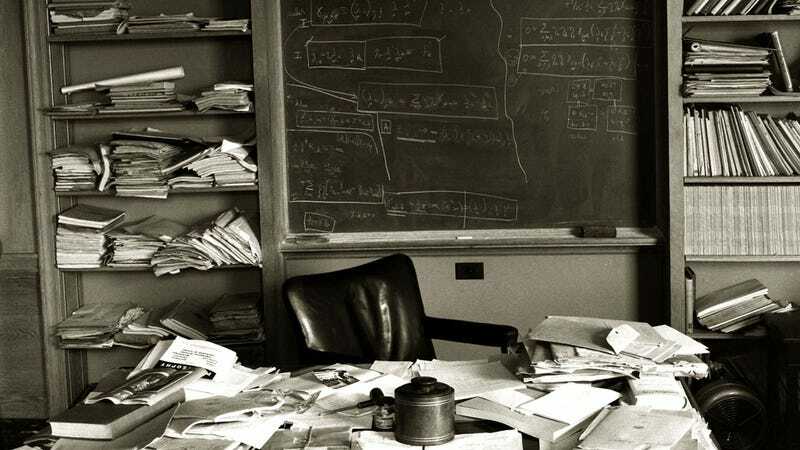 His passing was a huge loss, not just to physics but the entire academy—and, in the hours following his demise, photographer Ralph Morse managed to capture Einstein's Princeton office, just as he'd left it. "I headed to the hospital first but it was chaos — journalists, photographers, onlookers. So I headed over to Einstein's office [at the Institute for Advanced Study]. On the way, I stopped and bought a case of scotch. I knew people might be reluctant to talk, but that they're usually happy to accept a bottle of booze, rather than money, in exchange for their help. Anyway, I get to the building, find the superintendent, offer him a fifth of scotch and like that, he opens up the office."